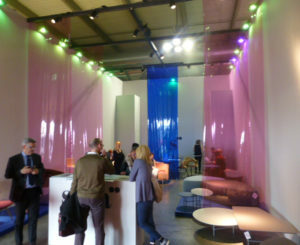 Salone Del Mobile is one of, if not the biggest design shows in the world. If you’ve been to the Las Vegas convention center, you know it’s enormous. Two million square feet of exhibit space to be exact. Salone’s exhibition space is twice that, at 4.3 million square feet! Not just a furniture show highlighting both classic and modern design, this year the show also featured workspace design, lighting design, and new designer showcase. And that’s just the show. Add to that a record 1,000 installations in five design districts around the city, and you start to get the picture of how gigantic this show is. Salone Del Mobile sets the trends for where furniture and design will head in the years to come; color, material, form, function are all showcased and, in many ways, established here. Not to mention, sited as it is in Milan, it’s all smashingly good fun. Style, fashion, history, food and drink, and three hundred and fourty thousand attendees make the city a whirlwind of excitement for a week every April. Look on to see what our Design Director, Kevin Trainor, saw as the major trends this year at Salone Del Mobile. Harvest gold is making a comeback! Designers are getting creative with showing swatches and material samples. Creative ways of dividing space was a huge trend at this year’s show. Natural pine was a popular material choice, but also fabric, plastic, and even chain link fencing! A strange but apparent trend, low ceilings. Bold uses of geometry and color were used to transform exhibit spaces into architectural marvels. On display were many inventive and beautiful examples of office furniture and solutions for workplace privacy. Architectural and sculptural installations as well as street & gallery events run throughout all of Milan during Salone. Although nearly impossible to pick favorites, here are a few.